An engaging and accessible introduction to the field, Understanding Media Industries helps students develop deeper and more critical knowledge of industries. 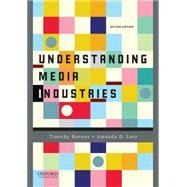 This book provides students with a thorough discussion of how media industries work, why they work as they do, and the broader theoretical and practical implications of media industry structure and function. The authors' unique Industrialization of Culture Framework organizes the book and helps students to consider media industries in different nations and historical periods. o How Does this Framework Work? o Why is Broadcasting Different? § How Are the Costs of Creating Media Products Funded?